Some reviews take little to no time out of my day. Others take forever, because I get hooked and spend more time than I care to admit beating the game in its entirety. 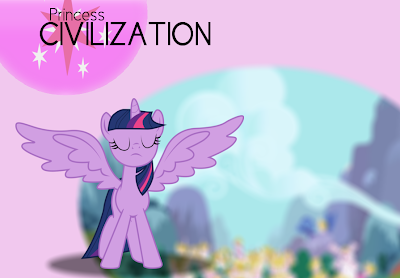 Princess Civilization falls into the latter category. Playing as Twilight Sparkle, it's up to you to send your scouts across Equestria, spreading peace and harmony as you go! The land is threatened with more than its share of grave danger, but the situation is salvageable with some old-fashioned 4X strategy. 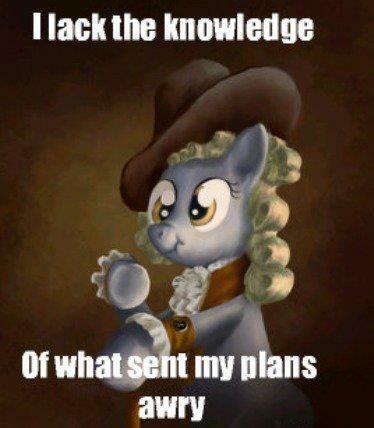 The game begins with an urgent message from Princess Celestia. Luna has gone missing, and Twilight Sparkle is left to control the expansion of harmony across the land of Equestria. Starting from Ponyville, the player must earn bits, collect elements, and sway local governments tile by tile. Fortunately, the game contains a full tutorial and plenty of hints for those of you unfamiliar with Civilization or other 4X games. However, while Spike's assistance is helpful, but you'll probably want to mute your volume: the voice acting is more than a little grating. The game hearkens back to developer Oracion's previous My Little Game Dev entry Everwinter, but unlike Everwinter, the game is fully functional and contains plenty of features to keep gameplay lively. Quests pop up every few turns, and the friendship levels of different towns must be regulated with constant gifts of elements from their more well-supplied neighbors. Internal building and foraging for elements in the wilderness also help to regulate element levels. Every last tile! Equestria is mine! Of course, as the exalted arbiter of friendship, you're required to settle disputes between ponies from time to time - answer correctly and you receive various rewards. Your power level as princess increases over time based on a combination of factors, gradually giving you access to prestige-related feats to improve Equestria's infrastructure. 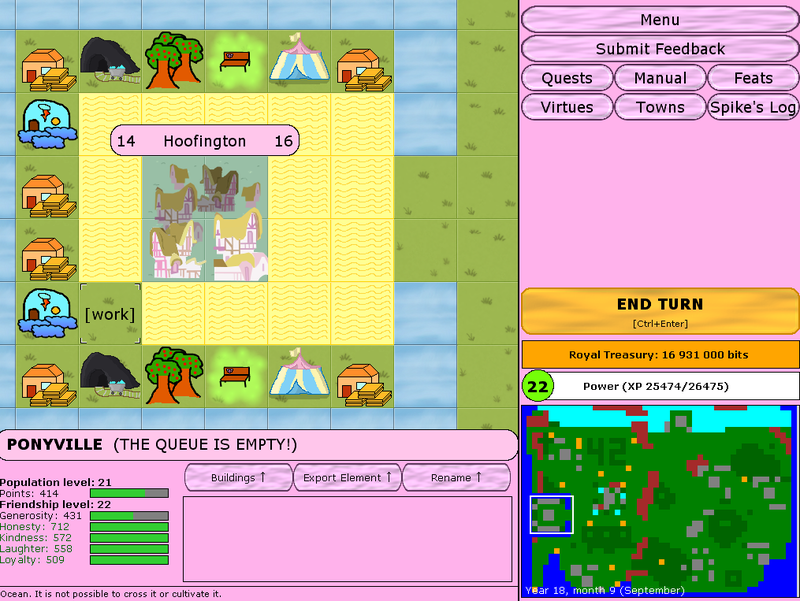 Princess Civilization benefits from a clear, intuitive infrastructure and the addition of all the little things that keep a game running smoothly (for instance, notices keeping track of idle ponies, towns and build queues.) The game's shortcomings are mostly aesthetic: to be frank, it needs an experienced spriter or two to gussy up the landscape. In addition to the spriting, if the cutscenes and dialogue were strengthened (polish on top of an already solid engine) Princess Civilization could be a very impressive game. In the turn-based strategy genre, however, function always trumps form. For this reason, Princess Civilization deserves an 8/10.